Foxp3+CD25+CD4+ regulatory T cells (Treg) mediate immunological self-tolerance and suppress immune responses. A subset of dendritic cells (DCs) in the intestine is specialized to induce Treg in a TGF-β- and retinoic acid-dependent manner to allow for oral tolerance. In this study we compare two major DC subsets from mouse spleen. We find that CD8+ DEC-205/CD205+ DCs, but not the major fraction of CD8− DC inhibitory receptor-2 (DCIR2)+ DCs, induce functional Foxp3+ Treg from Foxp3− precursors in the presence of low doses of Ag but without added TGF-β. CD8+CD205+ DCs preferentially express TGF-β, and the induction of Treg by these DCs in vitro is blocked by neutralizing Ab to TGF-β. In contrast, CD8−DCIR2+ DCs better induce Foxp3+ Treg when exogenous TGF-β is supplied. In vivo, CD8+CD205+ DCs likewise preferentially induce Treg from adoptively transferred, Ag-specific DO11.10 RAG−/− Foxp3−CD4+ T cells, whereas the CD8−DCIR2+ DCs better stimulate natural Foxp3+ Treg. These results indicate that a subset of DCs in spleen, a systemic lymphoid organ, is specialized to differentiate peripheral Foxp3+ Treg, in part through the endogenous formation of TGF-β. Targeting of Ag to these DCs might be useful for inducing Ag-specific Foxp3+ Treg for treatment of autoimmune diseases, transplant rejection, and allergy. Naturally occurring Foxp3+CD25+CD4+ regulatory T cells (Treg),4 which express the Foxp3 transcription factor and high affinity IL-2 receptor (CD25), derive from the thymus and sustain self-tolerance (1). Foxp3+ Treg can also be differentiated or induced from conventional Foxp3−CD25−CD4+ T cells in the periphery with some stimuli such as TGF-β supplementation (2, 3, 4, 5, 6). Natural and induced Foxp3+ Treg suppress autoimmunity as well as allergy, graft rejection, and immune responses to microbes and tumors (1, 5, 7, 8, 9, 10). It is important to understand the generation of Ag-specific Foxp3+ Treg to be able to suppress immunity in an Ag-specific manner and avoid global immune suppression by polyclonal Treg. T cell responses are controlled by dendritic cells (DCs). DCs are APCs specialized to capture and process Ags for presentation on MHC products and then to control the subsequent differentiation of T cells (11, 12, 13). Two such specializations are the expression of numerous receptors that mediate Ag uptake and processing (14, 15) and localization to the T cell-rich areas of peripheral lymphoid organs (16, 17). DCs initiate T cell immunity but can also induce tolerance, as is desirable in the case of harmless self and environmental Ags (18, 19, 20). Tolerance can develop by different pathways such as deletion (21, 22), induction of CD5 (23), or both induction and expansion of Treg (5, 24, 25, 26, 27, 28, 29, 30, 31). We have recently shown that relative to bulk spleen cells, DCs are much more effective inducers of functional Foxp3+ Treg from Foxp3− peripheral CD4+ T cells (9). Classical DCs in mouse spleen are comprised of two major subsets that express distinct markers and functions (12, 32, 33). One subset is CD8+ and DEC-205/CD205+, and the second is CD8−CD205− and DC inhibitory receptor-2 (DCIR2)+; the latter is recognized by the 33D1 mAb (32, 34, 35). Splenic DC subsets can have different functions in T cell differentiation, e.g., CD8+CD205+ DCs can induce IFN-γ-producing Th1 T cells whereas CD8−DCIR2+ DCs induce Th2 responses (36, 37, 38, 39). DC subsets, marked by the presence or absence of the CD103 integrin, are also evident in the intestine and intestine-associated lymphoid organs. It has recently been shown that the CD103+ subset is active in inducing Foxp3+ Treg from Foxp3− T cells in the presence of endogenous TGFβ, and that the DCs metabolize vitamin A to retinoic acid as an enhancing cofactor (40, 41). These reports found that CD103+ DCs from both mesenteric lymph node and lamina propria could induce a small fraction of Foxp3+ cells (2.5–9%) from Foxp3− precursors. In this study, we investigate the capacity of spleen DC subsets to induce OVA-specific Foxp3+ Treg. We find that CD8+ spleen DCs are selectively active and produce the required endogenous TGF-β, whereas CD8− spleen DCs require exogenous TGF-β but then become more proficient than CD8+ DCs at inducing Treg. We will also show that targeted in vivo Ag delivery to CD8+CD205+ DCs but not CD8−DCIR2+ DCs likewise preferentially induces Foxp3+ Treg, even though CD8−DCIR2+ DCs more efficiently form peptide-MHC II complexes (35) and better expand preformed natural Treg in vivo. These results indicate that the endogenous differentiation of Treg is controlled by select subsets of DCs in lymphoid tissues, and not only DC subsets in the intestine. Specific pathogen free, 6- to 8-wk, female, C57BL/6 (B6) and BALB/c mice were purchased from Taconic. DO11.10 RAG−/− mice were obtained through Taconic and the National Institute of Allergy and Infectious Diseases (National Institutes of Health) Exchange Program (42), whereas DO11.10 RAG+/+ mice were provided by Dr. P. Marrack (National Jewish Medical and Research Center, Denver, CO). We received generous gifts of OT-II mice from Dr. F. Carbone (University of Melbourne, Melbourne, Australia), FIR (Foxp3-internal ribosomal entry site-linked monomeric red fluorescent protein (RFP)) knockin mice from Dr. R. Flavell (Yale University, New Haven, CT) (43), and BALB/c Thy1.1+ mice from Drs. M. Lafaille and J. Lafaille (New York University, New York, NY). All mice were used according to guidelines of the Institutional Animal Care and Use Committee of The Rockefeller University (New York, NY). PE-, FITC-, PerCP-Cy5.5-, or allophycocyanin-conjugated anti-CD25 (clone 7D4), CD25 (clone PC61), CD4 (clone H129.19), CD8, DX5, B220, CD3, CD11c, streptavidin (SA) PE, SA-PE-Cy7, purified anti-CD16/CD32 (clone 2.4G2), anti-IL-10, and isotype rat Abs were from BD Pharmingen. Anti-CD11c, FITC, streptavidin, PE, DX5, CD19, and CD90.2 microbeads were from Miltenyi Biotec. Anti-DEC-205 (clone NLDC-145) and anti-DCIR2 (clone 33D1) were purified and labeled with biotin or Alexa Fluor 647 at the Monoclonal Antibody Core Facility of Memorial Sloan-Kettering Cancer Center (New York, NY) and The Rockefeller University. CFSE, LIVE/DEAD fixable aqua cell stain, TOPRO-3, and streptavidin Pacific blue was from Molecular Probes. Anti-mouse Foxp3 (clone FJK-16s) staining kit and anti-CD4-Alexa Fluor 700 were from eBioscience. Human TGF-β1, anti-mouse TGF-β mAb (clone 1D11), and isotype control were from R&D Systems. Human IL-2 was from Chiron. Anti-KJ1.26 mAb to the clonotypic receptor on OVA-specific DO11.10 TCR transgenic T cells was from Caltag/Invitrogen. Polyinosinic-polycytidylic acid (poly(I:C)) was from InVivoGen. CD4+ T cells were first negatively separated by MACS beads from lymph nodes and spleen cell suspensions (>90%) (Miltenyi Biotech) and further purified by flow cytometry (>99%). Spleen CD11c+ DCs were selected with anti-CD11c beads and further purified by flow cytometry into CD8+ or CD8− CD11c+B220−CD3−DX5− DCs (>95%). The DCs (2 × 104) were irradiated (15 Gy) before coculture with T cells (2 × 104). The purified T cells and APCs were cultured in 96-well plates (Corning Costar) with or without exogenous TGF-β (2 ng/ml) in the presence of OVA peptide (323–336). Live cell numbers per culture were calculated from the yields from flow cytometry. Cultured cells were first stained with anti-CD4, CD25, CD11c, and LIVE/DEAD aqua stain with or without the other Abs and, after fixation, intracellular Foxp3 was stained. BDLSRII, FACSort, FACSAria, or FACSDiva flow cytometers were used (BD Biosciences). To assess cell numbers, all cells were acquired from each culture and analyzed with FlowJo software (Tree Star). Spleen CD8+ or CD8− DCs were purified by flow cytometry from naive BALB/c mice or BALB/c mice that had been injected with 50 μg poly(I:C) 12 h before. The purified DCs were cultured in serum-free Nutridoma medium (Invitrogen) for 15–40 h. The concentrations of TGF-β in the supernatants were measured by TGF-β ELISA kit (R&D Systems). Following the manufacturer’s instructions, we measured the TGF-β with or without activation of the latent form of TGF-β. CFSE-labeled OVA-specific CD4+ T cells from DO11 RAG−/− mice (2 × 106) were adoptively transferred into BALB/c Thy1.1+ mice. The recipients were stimulated with indicated doses of chimeric anti-DEC-205 mAb with OVA (DEC-OVA), chimeric anti-DCIR2 mAb (33D1) fused with OVA (33D1-OVA), or chimeric isotype-matched mAb (Iso) fused with OVA (Iso-OVA) i.p. 1 day later. After 10–14 days, a mixture of spleen and lymph node cells was analyzed with FACS gating on the donor Thy1.2+ cells. For natural Treg, CD25+CD4+ T cells from Thy1.2+ DO11.10 transgenic mice were purified by flow cytometry and expanded with DCs, peptide, and IL-2 for 1 wk (25). The expanded Treg or freshly isolated Treg cells were CFSE labeled and adoptively transferred into BALB/c Thy1.1+ recipients 1 day before injection with DEC-OVA or 33D1-OVA. After 3 and 14 days, mixtures of spleen and lymph nodes were evaluated with FACS to monitor cell division by CFSE dilution and to enumerate Thy1.2+ cells. Chimeric mAbs (DEC-OVA, 33D1-OVA, and Iso-OVA) were produced by transient transfection as described (21, 35). All mAbs were tested for LPS contamination (Fisher-Cambrex) and decontaminated when necessary (Pierce). We further investigated our previous gene array data (Gene Expression Omnibus series accession no. GSE6259) (35). Briefly, CD11c+ DCs were enriched from spleens of B6 mice by depletion of lymphocytes with Abs to DX5, CD19, and CD90.2 on MACS beads (Miltenyi Biotech). Cells were stained with DEC-205-biotin, then with CD11c-PE, 33D1 (anti-DCIR2)-Alexa Fluor 647, and SA-PE-Cy7 and purified by cell sorting into CD11chighDCIR2highCD8− and CD11chighDEC-205highCD8+ on a FACSVantage. All cell samples were purified to >99% homogeneity. Total RNA was prepared using Qiagen RNeasy Mini kit (Qiagen). DNA microarray analysis of gene expression was performed at the gene array facility at Memorial Sloan-Kettering Cancer Center, Genomics Core Laboratory, New York). Fluorescent images of hybridized microarrays (MOE 430 2.0 array; Affymetrix) were obtained using an Affymetrix GeneChip Scanner. Microarray data was analyzed using Affymetrix GeneSpring version 7.0 software. All samples were repeated at least three times with individually sorted cells and averaged. Recently, it has been shown that DCs from mesenteric lymph nodes induce some Foxp3+ Treg cells using endogenous TGF-β (9). Given the specialized role of the CD103+ DC subset from the intestinal environment (40, 41), we hypothesized that a subset of DCs in systemic lymphoid tissue might also have a role in inducing Foxp3+ Treg in the periphery. We therefore evaluated two major CD8+ and CD8− DC subsets from spleen, purifying these on the FACS and adding the DCs to Foxp3−CD25− CD4+ T cells from OVA-specific, DO11.10 RAG−/− mice in the absence of exogenous TGF-β. After 5 days of culture, we observed that CD8+ DCs, but not CD8− DCs, differentiated some Foxp3+ Treg at two doses of OVA peptide (Fig. 1⇓, A and B, top). In contrast, after addition of TGF-β into the culture, CD8− DCs were more potent inducers if the total numbers of newly formed Foxp3+ Treg were measured (Fig. 1⇓, A and B, bottom). In the absence of Ag (Fig. 1⇓B) or the presence of a nonspecific MHC II binding peptide from influenza virus hemagglutinin (data not shown), both CD8+ DCs and CD8− DCs did not induce Foxp3. These results indicate that the minor subset of spleen CD8+ DCs is able to differentiate Foxp3+ Treg in an Ag-dependent manner. CD8+ splenic DCs (SpDC) differentiate Foxp3+ CD25+CD4+ Treg from Foxp3− CD25− CD4+ T cells in the absence of exogenous TGF-β in vitro. 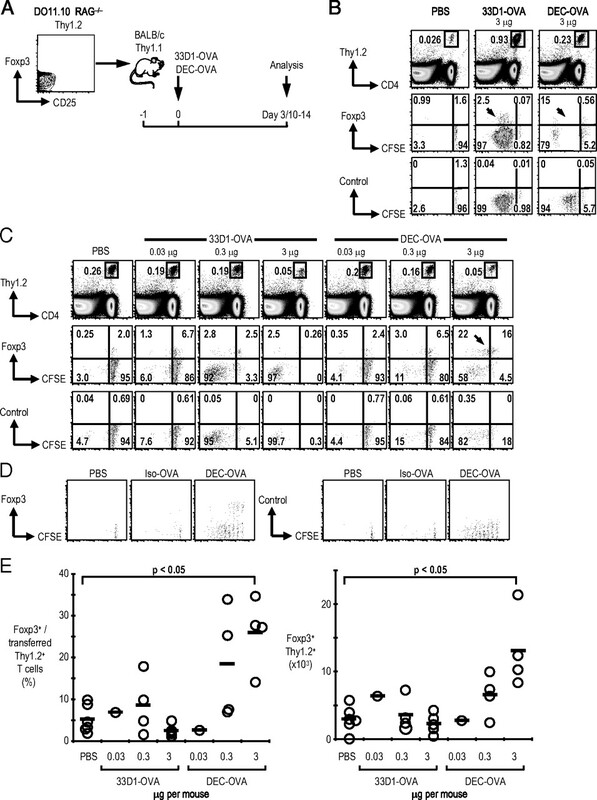 A, Freshly isolated Foxp3−CD25−CD4+ T cells from DO11.10 RAG−/− mice (2 × 104) were cultured with the indicated doses of peptide and CD8− or CD8+ DCs (2 × 104) in the absence or presence of TGF-β (2 ng/ml). After 5 days of culture, cells were analyzed by FACS. Representative gates of CD4+ CD11c+ cells are shown on the left. B, As in A, but the number of Foxp3+ cells, the percentage of Foxp3+ T cells/CD4+ T cells, and the number of CD4+ T cells per culture in the presence or absence of TGF-β are shown. The number of Foxp3+ cells at 0 μg/ml peptide was <102. A summary of five to seven separate experiments is shown; p values were provided by Student’s t test. The differentiation of Foxp3+ Treg from Foxp3− cells occurs by stimulation with TGF-β (2, 3, 4, 5, 9). To investigate whether endogenous TGF-β allows CD8+ DCs to differentiate Foxp3+ Treg, we performed blocking experiments with neutralizing anti-TGF-β and control mAb (Fig. 2⇓A). Anti-TGF-β blocked the induction of Foxp3+ Treg by CD8+ DCs, as measured by the percentage (Fig. 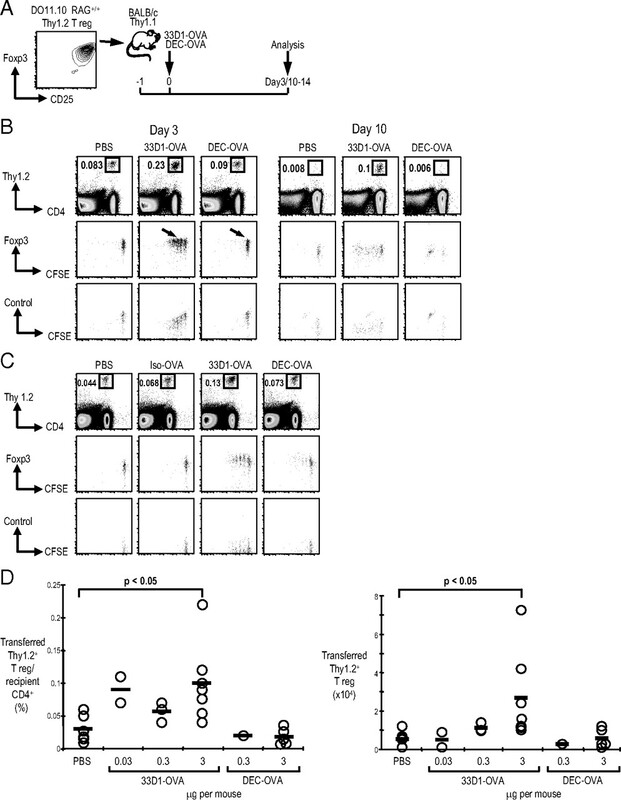 2⇓A) and also the total numbers of induced Foxp3+ Treg cells in the culture (Fig. 2⇓B). In addition to TGF-β, we investigated the role of IL-10, as IL-10 from pulmonary DCs helps to induce IL-10-producing Tr1-type Treg (44). However, the induction of Foxp3+ Treg by spleen CD8+ DCs was not blocked by the presence of neutralizing anti-IL-10 mAb in the culture (Fig. 2⇓, C and D). Therefore, it is unlikely that IL-10 has a role in the observed induction of Foxp3+ Treg by CD8+ spleen DCs. CD8+ DCs differentiate Foxp3+CD25+CD4+ Treg using endogenous TGF-β. A, Freshly isolated Foxp3−CD25−CD4+ T cells from DO11.10 RAG−/− mice (2 × 104) were cultured with 0.03 μg/ml peptide and CD8+ DCs (2 × 104) in the presence of anti-TGF-β mAb or isotype-matched control mAb (10 μg/ml). After 5 days of culture, cells were analyzed with FACS by gating on CD4+ CD11c− T cells. B, As in A, but the number of Foxp3+ cells, the percentage of Foxp3+ T cells/CD4+ T cells, and the number of CD4+ T cells per culture are shown. A summary of three separate experiments is depicted; p values were provided by Student’s t test. C, As in A, but cells were cultured in the presence of anti-IL-10 mAb or isotype control mAb (10 μg/ml). After 5 days of culture, cells were analyzed with FACS by gating on CD4+CD11c− T cells. D, As in C, but the number of Foxp3+ cells, the percentage of Foxp3+ T cells/CD4+ T cells, and the number of CD4+ T cells per culture are shown. These data are representative of three experiments. SpDC, Splenic DCs. To verify that TGF-β was being produced by DCs in the DC-T cell cultures, and in particular by CD8+CD205+ DCs, we did microarray analyses on RNA from CD8+CD205+CD11c+ and CD8−DCIR2+CD11c+ subsets. We found that CD8+CD205+ DCs selectively expressed TGF-β and the TGF-β binding protein (Ltbp2) (Fig. 3⇓A), which is important for the efficient secretion and appropriate localization of latent TGF-β (45). In contrast, CD8− DCIR2+ DCs express TGF-β receptor 1 and some members of the SMAD family of transcription factors (Fig. 3⇓A) that are activated by TGF-β receptors through phosphorylation (46). These results imply that CD8+ DCs can use endogenous TGF-β to induce Treg from Foxp3− precursors, whereas CD8− DCs are ready to respond to TGF-β that is provided from other types of cells. CD8+ DCs produce TGF-β. A, Total RNA was isolated from splenic CD8+DEC-205+ or CD8− DCIR2+ DCs (SpDC). Affymetrix gene array analysis showing relative levels of mRNAs associated with the TGF-β and TGF-β receptor signaling pathways expressed by CD8−DCIR2+ (left) and CD8+DEC-205+ DCs (right) purified from B6 mice. Each lane consists of three independent microarrays of mRNAs from different cell sorts. B, CD8+ or CD8− DCs from naive BALB/c mice or BALB/c mice that had been injected with poly(I:C) (PolyIC) 12 h before were cultured for 15–40 h in serum-free medium, and the concentrations of TGF-β in the supernatants were measured by ELISA. The concentration of TGF-β in the serum-free medium was 0. A summary of five separate experiments is shown; p value was provided by Student’s t test. C, CD8+ or CD8− DCs from naive BALB/c mice or BALB/c mice that had been injected with poly(I:C) 12 h before were purified by flow cytometry. Presort (top) and postsort (middle) plots are shown as gated on CD11c+ cells. The purified cells were further stained with CD86 (black line) and isotype control Abs (shaded gray line) (bottom). D, The purified CD8+ or CD8− DCs (2 × 104) from naive or poly(I:C) injected mice as in C were cultured with freshly isolated Foxp3−CD25−CD4+ T cells from DO11.10 RAG−/− mice (2 × 104) in the presence of 0.03 μg/ml peptide. After 5 days of culture, cells were analyzed with FACS by gating on CD4+CD11c− T cells. E, As in D, but the frequency of Foxp3+ T cells/CD4+ T cells per culture is also shown. These data are representative of three independent experiments with each experiment done in triplicate. p value was provided by Student’s t test. To confirm the production of TGF-β at the protein level, we cultured CD8+ or CD8− spleen DC subsets and measured TGF-β in the supernatants by ELISA (Fig. 3⇑B). We compared TGF-β concentrations with or without activation of the latent form of TGF-β. Without activation, TGF-β was not detected (data not shown). With activation, we observed a significant amount of TGF-β in the supernatants, with CD8+ spleen DCs producing higher amounts of TGF-β than CD8− spleen DCs (Fig. 3⇑B). To evaluate whether DC maturation affects the production of TGF-β by CD8+ or CD8− DCs, we chose one maturation stimulus, poly(I:C), because it acts as an effective adjuvant for DC-targeted vaccine (47). When BALB/c mice were injected i.p. with 50 μg of poly(I:C) 12 h earlier, CD8+ and CD8− DCs showed evidence of maturation with higher CD86, CD40, and class II expression (Fig. 3⇑C and data not shown). When the purified DCs were cultured, we found that the supernatants from the mature CD8+ DCs from poly(I:C)-injected mice contained less TGF-β compared with the immature CD8+ DCs from naive mice (Fig. 3⇑B). The mature CD8− DCs from poly(I:C)-injected mice produced the same amounts of TGF-β as immature CD8− DCs (Fig. 3⇑B). To evaluate whether the reduction of TGF-β production by mature DCs affects the induction of Foxp3, CD8+ DCs from poly(I:C)-injected mice or noninjected naive mice were cultured with DO11.10 RAG−/− CD4+ T cells. The frequency of the induced Foxp3+ Treg by the mature CD8+ DCs was much less than that by the immature CD8+ DCs (Fig. 3⇑, D and E). This indicates that spleen CD8+ DCs in the steady state produce a higher amount of a latent form of TGF-β that is essential for induction of Foxp3+ Treg than spleen CD8− DCs, and that one TLR ligand causes CD8+ DCs to reduce TGF-β production. To determine whether CD8+ and CD8− DCs induce Foxp3+ Treg with suppressive function, we used FIR knockin mice that had been crossed to OVA transgenic OT II B6 mice (FIR-OTII) (43) so that we could then purify induced FIR+, i.e., Foxp3+ cells, to test for suppression in an in vitro assay. Foxp3−CD25−CD4+ T cells from FIR-OTII mice were purified by flow cytometry and cultured with CD8+ DCs without TGF-β or CD8− DCs with TGF-β. After 5 days of culture, RFP+CD25+ and RFP−CD25−CD4+ T cells were purified by flow cytometry as in Fig. 4⇓A and added to an in vitro suppression assay comprised of CFSE-labeled CD25−CD4+ responder T cells stimulated with spleen APCs and anti-CD3 mAb (Fig. 4⇓, B and C). The proliferation of CD25−CD4+ T cells, as indicated by CFSE dilution as well as by live responder cell counts, was suppressed by the RFP+ CD25+CD4+ T cells induced by CD8+ DCs (Fig. 4⇓, B and C). In contrast, the response of the CFSE-labeled CD25−CD4+ cells was not inhibited by the addition of RFP− CD25−CD4+ T cells from the same culture (Fig. 4⇓, B and C). Similarly, the proliferation of CD25−CD4+ T cells was suppressed by the RFP+ CD25+CD4+ T cells induced by spleen CD8− DCs with TGF-β (Fig. 4⇓, B and C). Therefore, the Treg cells induced by spleen DC subsets have suppressive function. Suppressive function of Foxp3+CD25+ CD4+ Treg induced by CD8+ or CD8− DCs. A, Foxp3−CD25−CD4+ T cells (2 × 104) from FIR-OTII mice were cultured with spleen CD8+ DCs (2 × 104) in the presence of peptide (0.03–0.1 μg/ml) without TGF-β. After 5–6 days, the induced Foxp3+CD25+CD4+ Treg and Foxp3−CD25−CD4+ T cells were purified by flow cytometry. Similarly, Foxp3−CD25−CD4+ T cells from FIR-OTII mice were also cultured with spleen CD8− DCs in the presence of peptide (0.03–0.1 μg/ml) with TGF-β (2 ng/ml), and the induced Foxp3+CD25+CD4+ Treg cells were purified by flow cytometry. The insets in the presort boxes indicate the gate for sorting. The purity of sorted cells is also shown (postsort). B, For the suppression assay, CD25−CD4+ responder T cells (1 × 104) from B6 mice were CFSE-labeled and stimulated with spleen APCs (5 × 104) and anti-CD3 mAb. To these, the suppressors (1 × 104) as above were added. After 3 days, CFSE-dilution was analyzed by flow cytometry. Dead cells were gated out by TOPRO-3 iodide. These data are representative of three independent experiments. C, As in B, but the number of live CFSE+ CD25−CD4+ responder cells per culture was shown. The indicated suppressors were added in the culture at the indicated ratio. These data are representative of two independent experiments. To investigate whether cell proliferation took place during the induction of Treg, CD4+ T cells were isolated from DO11.10 RAG−/− mice, CFSE labeled, and cultured with spleen CD8+ DCs without exogenous TGF-β or CD8− DCs with exogenous TGF-β. In both instances, the newly formed Foxp3+ Treg cells were almost entirely derived from T cells that had undergone two to five cycles of cell division (Fig. 5⇓, see arrows). This result indicates that proliferating cells are induced to express Foxp3 upon Ag stimulation with DCs. Treg proliferate during differentiation by DC subsets. Foxp3− CD25−CD4+ T cells from DO11.10 RAG−/− mice (2 × 104) were CFSE labeled and cultured with CD8+ DCs (2 × 104) without TGF-β (2 ng/ml) or CD8− DCs (2 × 104) with TGF-β in the presence or absence of OVA peptide (0.03 μg/ml). At day 5, cells were stained with anti-Foxp3 mAb. Foxp3 expression and CFSE dilution are shown gated on live CD11c− CD4+ T cells. This data are representative of three independent experiments. SpDC, Splenic DCs. Ag delivery via DEC-205 mAb can induce Foxp3+ Treg from Foxp3− T cells (48), but it is not known whether Ag delivery to the other DC subset via 33D1 mAb can also induce Foxp3. To compare the induction of Treg by the two major DC subsets in vivo, we adoptively transferred Foxp3−CD25−CD4+ T cells from Thy1.2+ DO11.10 RAG−/− transgenic mice into Thy1.1+ BALB/c mice and stimulated them with OVA delivered by mAbs to DEC-205 (DEC-OVA) or DCIR2 (33D1-OVA) (35). The cells from DO11.10 RAG−/− transgenic mice were also CFSE-labeled before transfer to follow cell proliferation in response to DEC-OVA or 33D1-OVA (Fig. 6⇓A). Three days later, 33D1-OVA induced more effective proliferation of transferred Thy1.2+CD4+ T cells than DEC-OVA (Fig. 6⇓B). When expression of Foxp3 and CFSE dilution were assessed on these cells at day 3, proliferating cells expressed Foxp3 as indicated by the arrows, although 33D1-OVA induced a greater proportion of proliferating Foxp3− cells (Fig. 6⇓B). Ten to 14 days later, the numbers of recovered transferred Thy1.2+CD4+ T cells showed a sizable reduction following the 3-μg dose of the Ab-OVA proteins, suggesting T cell deletion as a result of stimulation with either DEC-OVA or 33D1-OVA (Fig. 6⇓C) as previously reported (21, 35, 49). When Foxp3 expression and CFSE dilution were evaluated on the remaining Thy1.2+ T cells, Foxp3 was induced on undivided cells as well as on T cells that had undergone cell division, but mainly in response to DEC-OVA (3 μg) rather than 33D1-OVA (Fig. 6⇓C). Nevertheless, 33D1-OVA induced strong proliferation of CD4+ T cells by the cells that did not express Foxp3 (Fig. 6⇓C). When a control isotype-matched mAb fused with OVA (Iso-OVA) (35) was used, DO11.10 T cells did not induce Foxp3 (Fig. 6⇓D). The percentages and numbers of the induced Foxp3+ T cells were higher with 3 μg of DEC-OVA than with all tested doses of 33D1-OVA (Fig. 6⇓E), even though the CD8−DCIR2+ DC subset more rapidly produces peptide-MHC II complexes (35). Thus, Ag delivery to CD8+CD205+ DCs in vivo selectively induced more Foxp3+ Treg cells from Foxp3− precursors. DC targeting of OVA via DEC-205 leads to the development of Foxp3+CD25+CD4+ T cells in vivo. A, Thy1.2+ DO11.10 RAG−/− mice lack Foxp3+CD25+CD4+ T cells as shown in the plots. 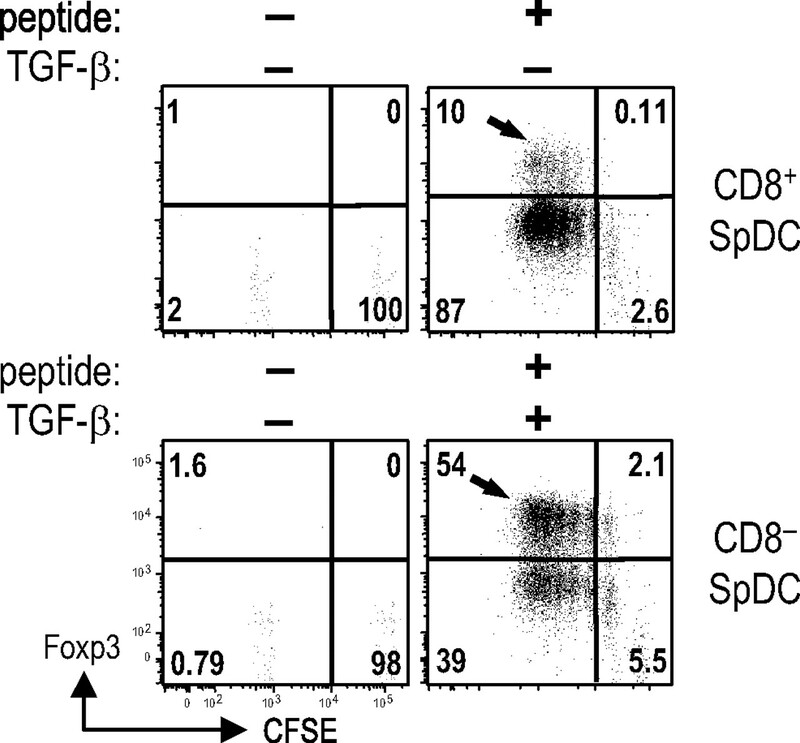 The Foxp3−CD25−CD4+ T cells were CFSE- labeled (2 × 106) and injected i.v. into Thy1.1+ BALB/c mice. The recipients were stimulated with indicated doses of DEC-OVA or 33D1-OVA i.p. 1 day later. After 3 or 10–14 days, spleen and lymph node Thy1.2+ cells were analyzed by FACS. B, As in A, but the frequencies of donor Thy1.2+ DO11.10 RAG−/− CD4+ T cells within gates at day 3 are shown in the top row. Foxp3, isotype control staining, and CFSE dilution gated on Thy1.2+ transferred DO11.10 RAG−/− CD4+ T cells are shown in the middle and bottom rows. These data are representative of two independent experiments. C, As in A, but the frequencies of donor Thy1.2+ DO11.10 RAG−/− CD4+ T cells within gates at day 13 are shown in the top row. Foxp3, isotype control staining and CFSE dilution gated on the Thy1.2+ transferred DO11.10 RAG−/− CD4+ T cells are shown in the middle and bottom rows. D, As in A, but recipient mice were stimulated with PBS, 3 μg of DEC-OVA, or Iso-OVA i.p. 1 day later. After 13 days, a mixture of spleen and lymph nodes was analyzed by FACS. Foxp3 (left), isotype control staining (right), and CFSE dilution gated on the Thy1.2+ transferred DO11.10 RAG−/− CD4+ T cells are shown. Data are representative of three independent experiments. E, Cell recoveries of Foxp3+Thy1.2+ T cells from transferred DO11.10 RAG−/− CD4+ T cells at days 10–14 are shown as percentages per Thy1.2+ T cells (left) and absolute numbers from each mouse (right). A summary of five separate experiments where each data point is a separate experiment is shown; p value is from Student’s t test. It is not known how already existing natural Foxp3+ Treg behave after the targeting of Ags to DC-subsets in vivo. To address this question, we compared the proliferation of Foxp3+ Treg by DEC-OVA and 33D1-OVA in vivo (35). Natural Foxp3+ Treg from Thy1.2+ DO11.10 RAG+/+ OVA CD4 transgenic mice were purified by flow cytometry and expanded with DCs, peptide, and IL-2 for 1 wk (25). The expanded natural Treg (>90% Foxp3+) were CFSE labeled and adoptively transferred into Thy1.1+ BALB/c recipients 1 day before injection with DEC-OVA or 33D1-OVA (Fig. 7⇓A). After 3 and 10–14 days, mixtures of spleen and lymph node cells were evaluated for proliferation of Foxp3+ Treg. We used DC-expanded Foxp3+ Treg for in vivo transfer because of the larger number of cells after in vitro expansion. At day 3, more transferred Thy1.2+ DO11 Foxp3+ Treg were observed after 3 μg of 33D1-OVA than 3 μg of DEC-OVA (Fig. 7⇓B). At day 10, the Treg cells stimulated by both Abs were deleted compared with day 3; however, when Ag was delivered by 33D1, the transferred Thy1.2+ DO11 Treg cells were more numerous (Fig. 7⇓B). When the expression of Foxp3 and CFSE dilution were investigated, Ag delivery by 33D1, in contrast to Ag delivery by DEC-205, induced >3 cell divisions and, importantly, the divided Treg maintained high expression of Foxp3 (Fig. 7⇓B). When Iso-OVA was used, neither the DC-expanded Treg nor freshly isolated DO11.10 Treg cells divided at day 3 as in PBS controls (freshly isolated Treg cells are shown in Fig. 7⇓C). Also, the absolute numbers of Thy1.2+Foxp3+ Treg at day 10–14 were higher after stimulation with 3 μg of 33D1-OVA (Fig. 7⇓D). Thus, Ag delivery to CD8−DCIR2+ DCs, relative to CD8+CD205+ DCs in vivo, results in better stimulation of natural Foxp3+ Treg. DC targeting of OVA via 33D1 better sustains naturally occurring Foxp3+CD25+CD4+ T cells in vivo. A, CD25+CD4+Foxp3+ T cells from Thy1.2+ DO11.10 transgenic mice were cultured with mature DCs, peptide, and IL-2. After 7 days, the expanded Treg were >90% CD25+Foxp3+. The expanded Treg (0.5∼1 × 106) cells were CFSE labeled and adoptively transferred into Thy1.1+ BALB/c mice. One day later, the mice were i.p. injected with 3 μg of 33D1-OVA or DEC-OVA Ab or PBS. Spleen and lymph node cells were mixed and analyzed by FACS at day 3 or 14. B, Mixtures of spleen and lymph node cells at day 3 or 10 after injection of 33D1-OVA or DEC-OVA Ab or PBS were stained with anti-CD4 and anti-Thy1.2 (top). Foxp3, isotype control staining, and CFSE dilution gated on Thy1.2+ transferred DO11.10 Treg cells are shown in the middle and bottom rows. C, As in A, but freshly isolated CFSE-labeled Thy1.2 DO11.10 CD25+CD4+ Treg cells were transferred into Thy1.1+ BALB/c mice. One day later, the mice were i.p. injected with 3 μg of 33D1-OVA or DEC-OVA Ab, Iso-OVA, or PBS. Spleen and lymph node cells were mixed and analyzed by FACS at day 3. Data are representative of two independent experiments. D, As in A, but cell recovery of Thy1.2+ transferred DO11.10 Treg at day 10–14 is shown. A summary of five separate experiments is shown; p value is from Student’s t test. CD103+ DCs in the intestinal environment are specialized to differentiate Foxp3+ Treg cells, and this contributes to the induction of oral tolerance in the gut (40, 41). However, self-tolerance to tissue-specific Ags also needs to be induced elsewhere in the body (18). We wondered whether DCs in systemic lymphoid organs could be involved in inducing Treg in the periphery. We therefore investigated the capacity of two major spleen DC subsets to differentiate Foxp3+ Treg from Foxp3− precursors. We found that CD8+ CD205+ DCs were selectively active in vitro and in vivo. Therefore, CD8+ CD205+ DCs from the spleen can differentiate Foxp3+ Treg from Foxp3− precursors in the periphery, as CD103+ DCs can induce Foxp3 in the intestinal environment. Mechanistic studies indicated that spleen CD8+ CD205+ DCs selectively produced the requisite TGF-β required for Treg differentiation. Interestingly, CD8+CD205+ DCs also are specialized to take up dying cells (50, 51). Presentation of allogeneic apoptotic cells by CD8+ DCs resulted in deletion of alloreactive T cells and induction of Foxp3+ Treg (52). Apoptotic cell death is associated with secretion of anti-inflammatory cytokines such as TGF-β (53). Therefore, it is possible that CD8+CD205+ DCs in the steady state take up apoptotic cells and that this triggers endogenous TGF-β secretion. CD103+ DCs in the intestinal environment can differentiate Foxp3+ Treg with endogenous TGF-β (40). TGF-β is a cytokine that is highly expressed in mucosal tissues (54, 55). CD103+ DCs in the intestine have retinal dehydrogenase to convert vitamin A or retinal into retinoic acid, which is an essential cofactor for the induction of Foxp3+ Treg by TGF-β (40, 41) and for the induction of gut tropism for T cells and IgA-secreting B cells (56, 57). Lamina propria macrophages also play a role in inducing Foxp3+ Treg, although TGF-β needs to be added to the inductive cultures (58). These findings suggest that the intestinal environment is specialized for inducing Foxp3+ Treg for intestinal Ags. When we examined the induction of Foxp3+ Treg by DEC targeting in lymph nodes, we found that DEC-OVA induced Foxp3 in lymph nodes (data not shown). CD8+CD205+ DCs from lymph nodes also induced Foxp3+ Treg in vitro (J. Idoyaga, S. Yamazaki, and Ralph M. Steinman, unpublished data). However, CD8− DCs from lymph nodes appear more complex than spleen DCs because they can be divided into more subsets (12, 33). Other types of DCs might participate in inducing Foxp3+ Treg. More mature DCs in the human thymus, following stimulation by thymic stromal lymphopoietin, are responsible for generating natural Foxp3+ Treg from CD8−CD4+CD25− human thymocytes (59). Also, plasmacytoid DCs are required for Ag-specific regulatory tolerance following donor splenocyte transfusion plus anti-CD40 ligand mAb (60). CD205+ DCs are able to differentiate Foxp3+ Treg in vivo following targeted delivery of Ag within mAb to DEC-205 (48, 61), but it has been uncertain whether Foxp3+ Treg cells are induced only by Ag delivery to CD205+ DCs. We found that Ag delivery to CD8−DCIR2+ DCs in vivo is much less efficient for inducing Foxp3+ Treg from Foxp3− precursors. In vitro blocking assays, microarray, and ELISA results indicate that CD8+CD205+ DCs use endogenous TGF-β, in contrast to CD8−DCIR2+ DCs, to induce Foxp3. Kretschmer et al. reported that Foxp3+ Treg were more efficiently induced with low doses of anti-DEC-205-hemagglutinin peptide fusion mAb, which was a subimmunogenic condition (48). Ag delivered by the 33D1 mAb to CD8− DCIR2+ DCs in the steady state are processed and transferred to the cell surface more efficiently as MHC-class II peptide complexes (35). Therefore, it is also possible that the amounts of MHC class II peptide complexes after Ag delivery by anti-DEC-205 and 33D1 mAbs were different even though we injected the same amounts of DEC-OVA and 33D1-OVA mAbs. Our group previously reported that in vivo Ag delivery to CD205+ DCs by DEC-205 mAb induced deletion of adoptively transferred transgenic T cells (21, 35, 49). In these reports, we did not investigate the induction of Foxp3+ Treg in the remaining T cells, although other groups have shown that Treg could be induced by DEC targeting (48, 61). Although Hawiger et al. (23) described that CD25 was not up-regulated on the remaining T cells after DEC targeting, a higher dose of anti-DEC-205 Ag and shorter observation times was used compared with this study, and Foxp3 Abs were not used to monitor the response. In this study we confirmed that in vivo Ag delivery to CD8+CD205+ DCs induce Foxp3+ Treg on remaining T cells; however, it has not been studied whether T cells stimulated by DEC targeting actively induced apoptosis during the deletion process. In contrast, Ag delivery to CD8− DCIR2+ DCs stimulates natural Foxp3+ Treg better than CD8+ CD205+ DCs in vivo. Natural Treg proliferate in response to their selecting self-peptide in vivo (62, 63, 64, 65). CD8−DCIR2+ DCs excel in producing MHC class II-peptide complexes compared with CD8+CD205+ DCs (35). This might explain the better response by natural Foxp3+CD25+CD4+ Treg to Ag delivery to CD8−DCIR2+ DCs. CD8− DCIR2+ DCs might have additional intrinsic differences to stimulate natural Foxp3+ Treg relative to CD8+CD205+ DCs beyond the preferential processing of the MHC class II pathway. For example, the function of natural Foxp3+ Treg is maintained by IL-2 (66, 67, 68, 69, 70, 71), and IL-2 is known to be produced from DCs stimulated with bacterial products (72). However, we did not see a difference in IL-2 expression by DC subsets in our gene array data (data not shown). At the mRNA level, our gene array data showed that CD8+CD205+ DCs expressed TGF-β and TGF-β binding protein, whereas CD8− DCIR2+ DCs expressed TGF-β receptor and the downstream transcription factors SMAD1 and SMAD4. This suggests that TGF-β from CD8+CD205+ DCs can act on Foxp3− precursors to induce Foxp3, in contrast to CD8− DCIR2+ DCs, which are ready to respond to TGF-β. DCs express αvβ8 integrins, which activate latent TGF-β, and this process is important for induction and homeostasis of Foxp3+ Treg (73). TGF-β could be provided by natural Foxp3+ Treg (74, 75, 76), and TGF-β regulates the homeostasis and function of Foxp3+ Treg (75, 77, 78). T cells from TGF-β receptor II dominant negative mice did not induce Foxp3 after Ag delivery by DEC-205 mAb in vivo (48). Therefore, TGF-β signaling on T cells seems to play a role in inducing Foxp3+ Treg in the periphery, but it is important to investigate whether TGF-β signaling on DCs might additionally influence the induction of Treg. We confirmed that spleen CD8+ DCs produced higher amounts of TGF-β than spleen CD8− DCs by ELISA (Fig. 3⇑B). DC maturation is a complex subject because of the large number of different maturation stimuli and their different mechanisms of action. However, we tested one of the stimuli, poly(I:C), and found that maturing CD8+ DCs in poly(I:C) reduced the production of TGF-β. Consistent with the idea that immature DCs are inducing tolerance whereas mature DCs are actively inducing immunity (18), we observed that the frequency of induced Foxp3+ Treg was reduced by poly(I:C)-matured CD8+ DCs (Fig. 3⇑, D and E). Further studies are needed to understand how different maturation stimuli affect the capacity of DC to induce Treg in vivo. The factors that allow DCs to control the different pathways of T cell differentiation need to be identified, because this will permit a better understanding of DC function in vivo and in the design of new immune-based treatments. Our findings indicate that endogenous production of TGF-β in the context of a particular DC subset in systemic lymphoid tissues, i.e., the CD8+CD205+ spleen DC itself, permits the peripheral induction of Foxp3+ Treg even in the steady state. We propose that the delivery of Ag to CD8+CD205+ DCs provides a means for the induction of therapeutic Ag-specific Foxp3+ Treg cells from Foxp3− T cells, as in autoimmune diseases, allergy, or transplant rejection. We thank Klara Velinzon and Tamara Shengelia for expert cell sorting, at Memorial Sloan-Kettering Cancer Center Geneomics Core Laboratory for performing gene arrays, Judy Adams for help with graphics, Lucio Verani for help with references, Falk Nimmerjahn for reading the manuscript, Maria Lafaille and Juan Lafaille for BALB/c Thy1.1+ mice, and Richard Flavell for FIR mice. DO11.10 RAG−/− mice were obtained through the National Institute of Allergy and Infectious Diseases Exchange Program. M. C. Nussenzweig and R. M. Steinman have financial interests in Celldex, which is developing anti-DEC-205 antibodies for human use. The other authors have no conflicting financial interests. ↵1 This work was supported by National Institutes of Health Grant AI 051573, a program project grant from the Juvenile Diabetes Research Foundation, and German Research Foundation Grants DU-548/1-1 and DU-548/2-1 (to D.D.). ↵2 S.Y. and D.D. are equal contributing first authors. ↵4 Abbreviations used in this paper: Treg, regulatory T cell; DC, dendritic cell; DCIR2, DC inhibitory receptor-2; DEC, anti-DEC-205 mAb; FIR, Foxp3-internal ribosomal entry site-linked monomeric RFP; Iso, isotype-matched mAb; poly(I:C), polyinosinic-polycytidylic acid; RFP, red fluorescent protein; SA, streptavidin; 33D1, anti-DCIR2 mAb. Zheng, S. G., J. H. Wang, W. Stohl, K. S. Kim, J. D. Gray, D. A. Horwitz. 2006. TGF-β requires CTLA-4 early after T cell activation to induce FoxP3 and generate adaptive CD4+CD25+ regulatory cells. J. Immunol. 176: 3321-3329. Weber, S. E., J. Harbertson, E. Godebu, G. A. Mros, R. C. Padrick, B. D. Carson, S. F. Ziegler, L. M. Bradley. 2006. Adaptive islet-specific regulatory CD4 T cells control autoimmune diabetes and mediate the disappearance of pathogenic Th1 cells in vivo. J. Immunol. 176: 4730-4739. Luo, X., K. V. Tarbell, H. Yang, K. Pothoven, S. L. Bailey, R. Ding, R. M. Steinman, M. Suthanthiran. 2007. Dendritic cells with TGF-β1 differentiate naive CD4+CD25− T cells into islet-protective Foxp3+ regulatory T cells. Proc. Natl. Acad. Sci. USA 104: 2821-2826. Davidson, T. S., R. J. Dipaolo, J. Andersson, E. M. Shevach. 2007. IL-2 is essential for TGF-β-mediated induction of Foxp3+ T regulatory cells. J. Immunol. 178: 4022-4026. Bluestone, J. A.. 2005. Regulatory T-cell therapy: is it ready for the clinic?. Nat. Rev. Immunol. 5: 343-349. Yamazaki, S., A. J. Bonito, R. Spisek, M. Dhodapkar, K. Inaba, R. M. Steinman. 2007. Dendritic cells are specialized accessory cells along with TGF-β for the differentiation of Foxp3+CD4+ regulatory T cells from peripheral Foxp3− precursors. Blood 110: 4293-4302. Dipaolo, R. J., C. Brinster, T. S. Davidson, J. Andersson, D. Glass, E. M. Shevach. 2007. Autoantigen-specific TGFβ-induced Foxp3+ regulatory T cells prevent autoimmunity by inhibiting dendritic cells from activating autoreactive T cells. J. Immunol. 179: 4685-4693. Reis e Sousa, C.. 2006. Dendritic cells in a mature age. Nat. Rev. Immunol. 6: 476-483. Steinman, R. M., J. Banchereau. 2007. Taking dendritic cells into medicine. Nature 449: 419-426. Villadangos, J. A., P. Schnorrer. 2007. Intrinsic and cooperative antigen-presenting functions of dendritic-cell subsets in vivo. Nat. Rev. Immunol. 7: 543-555. Figdor, C. G., Y. van Kooyk, G. J. Adema. 2002. C-type lectin receptors on dendritic cells and Langerhans cells. Nat. Rev. Immunol. 2: 77-84. Trombetta, E. S., I. Mellman. 2005. Cell biology of antigen processing in vitro and in vivo. Annu. Rev. Immunol. 23: 975-1028. Lindquist, R. L., G. Shakhar, D. Dudziak, H. Wardemann, T. Eisenreich, M. L. Dustin, M. C. Nussenzweig. 2004. Visualizing dendritic cell networks in vivo. Nat. Immunol. 5: 1243-1250. Mempel, T. R., S. E. Henrickson, U. H. Von Andrian. 2004. T-cell priming by dendritic cells in lymph nodes occurs in three distinct phases. Nature 427: 154-159. Morelli, A. E., A. W. Thomson. 2007. Tolerogenic dendritic cells and the quest for transplant tolerance. Nat. Rev. Immunol. 7: 610-621. Iwasaki, A.. 2007. Mucosal dendritic cells. Annu. Rev. Immunol. 25: 381-418. Hawiger, D., K. Inaba, Y. Dorsett, M. Guo, K. Mahnke, M. Rivera, J. V. Ravetch, R. M. Steinman, M. C. Nussenzweig. 2001. Dendritic cells induce peripheral T cell unresponsiveness under steady state conditions in vivo. J. Exp. Med. 194: 769-780. Hawiger, D., R. F. Masilamani, E. Bettelli, V. K. Kuchroo, M. C. Nussenzweig. 2004. Immunological unresponsiveness characterized by increased expression of CD5 on peripheral T cells induced by dendritic cells in vivo. Immunity 20: 695-705. Dhodapkar, M. V., R. M. Steinman, J. Krasovsky, C. Münz, N. Bhardwaj. 2001. Antigen specific inhibition of effector T cell function in humans after injection of immature dendritic cells. J. Exp. Med. 193: 233-238. Yamazaki, S., T. Iyoda, K. Tarbell, K. Olson, K. Velinzon, K. Inaba, R. M. Steinman. 2003. Direct expansion of functional CD25+CD4+ regulatory T cells by antigen processing dendritic cells. J. Exp. Med. 198: 235-247. Tarbell, K. V., S. Yamazaki, K. Olson, P. Toy, R. M. Steinman. 2004. CD25+ CD4+ T cells, expanded with dendritic cells presenting a single autoantigenic peptide, suppress autoimmune diabetes. J. Exp. Med. 199: 1467-1477. Fehervari, Z., S. Sakaguchi. 2004. Control of Foxp3+ CD25+CD4+ regulatory cell activation and function by dendritic cells. Int. Immunol. 16: 1769-1780. Levings, M. K., S. Gregori, E. Tresoldi, S. Cazzaniga, C. Bonini, M. G. Roncarolo. 2005. Differentiation of Tr1 cells by immature dendritic cells requires IL-10 but not CD25+CD4+ Tr cells. Blood 105: 1162-1169. Brinster, C., E. M. Shevach. 2005. Bone marrow-derived dendritic cells reverse the anergic state of CD4+CD25+ T cells without reversing their suppressive function. J. Immunol. 175: 7332-7340. Yamazaki, S., M. Patel, A. Harper, A. Bonito, H. Fukuyama, M. Pack, K. V. Tarbell, M. Talmor, J. V. Ravetch, K. Inaba, R. M. Steinman. 2006. 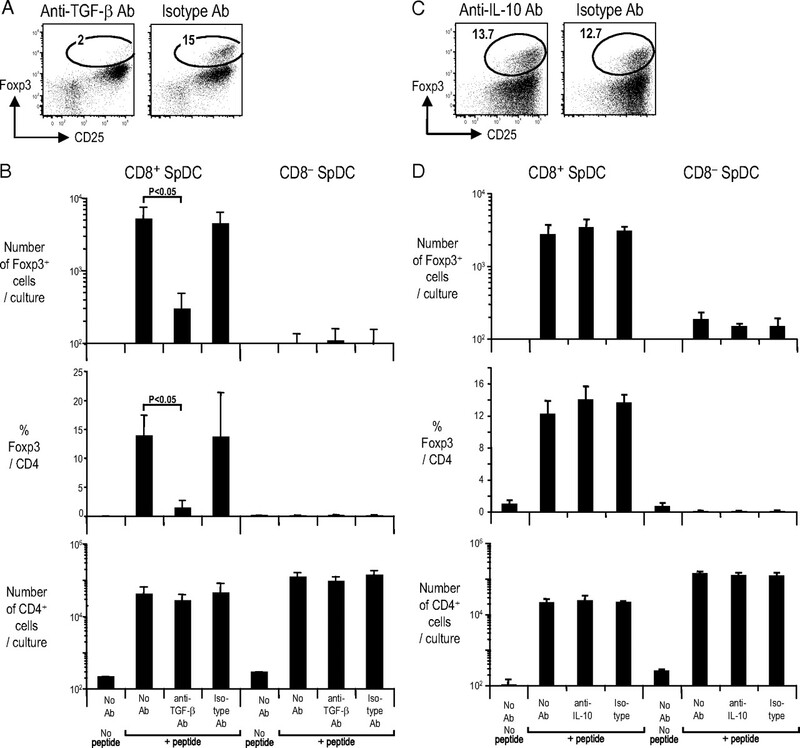 Effective expansion of alloantigen-specific Foxp3+ CD25+ regulatory T cells by dendritic cells during the mixed leukocyte reaction. Proc. Natl. Acad. Sci. USA 103: 2758-2763. Yamazaki, S., K. Inaba, K. V. Tarbell, R. M. Steinman. 2006. Dendritic cells expand antigen-specific Foxp3+CD25+CD4+ regulatory T cells including suppressors of alloreactivity. Immunol. Rev. 212: 314-329. Crowley, M., K. Inaba, M. Witmer-Pack, R. M. Steinman. 1989. The cell surface of mouse dendritic cells: FACS analyses of dendritic cells from different tissues including thymus. Cell. Immunol. 118: 108-125. Shortman, K., Y. J. Liu. 2002. Mouse and human dendritic cell subtypes. Nat. Rev. Immunol. 2: 151-161. Nussenzweig, M. C., R. M. Steinman, M. D. Witmer, B. Gutchinov. 1982. A monoclonal antibody specific for mouse dendritic cells. Proc. Natl. Acad. Sci. USA 79: 161-165. Dudziak, D., A. O. Kamphorst, G. F. Heidkamp, V. Buchholz, C. Trumpfheller, S. Yamazaki, C. Cheong, K. Liu, H. W. Lee, C. G. Park, et al 2007. Differential antigen processing by dendritic cell subsets in vivo. Science 315: 107-111. Pulendran, B., J. L. Smith, G. Caspary, K. Brasel, D. Pettit, E. Maraskovsky, C. E. Maliszweski. 1999. Distinct dendritic cell subsets differentially regulate the class of immune responses in vivo. Proc. Natl. Acad. Sci. USA 96: 1036-1041. Maldonado-Lopez, R., T. De Smedt, P. Michel, J. Godfroid, B. Pajak, C. Heirman, K. Thielemans, O. Leo, J. Urbain, M. Moser. 1999. CD8a+ and CD8α− subclasses of dendritic cells direct the development of distinct T helper cells in vivo. J. Exp. Med. 189: 587-592. Maldonado-Lopez, R., C. Maliszewski, J. Urbain, M. Moser. 2001. Cytokines regulate the capacity of CD8α+ and CD8α− dendritic cells to prime Th1/Th2 cells in vivo. J. Immunol. 167: 4345-4350. Soares, H., H. Waechter, N. Glaichenhaus, E. Mougneau, H. Yagita, O. Mizenina, D. Dudziak, M. C. Nussenzweig, R. M. Steinman. 2007. A subset of dendritic cells induces CD4+ T cells to produce IFN-γ by an IL-12-independent but CD70-dependent mechanism in vivo. J. Exp. Med. 204: 1095-1106. Coombes, J. L., K. R. Siddiqui, C. V. Arancibia-Carcamo, J. Hall, C. M. Sun, Y. Belkaid, F. Powrie. 2007. A functionally specialized population of mucosal CD103+ DCs induces Foxp3+ regulatory T cells via a TGF-β- and retinoic acid-dependent mechanism. J. Exp. Med. 204: 1757-1764. Wan, Y. Y., R. A. Flavell. 2005. Identifying Foxp3-expressing suppressor T cells with a bicistronic reporter. Proc. Natl. Acad. Sci. USA 102: 5126-5131. Akbari, O., R. H. DeKruyff, D. T. Umetsu. 2001. Pulmonary dendritic cells producing IL-10 mediate tolerance induced by respiratory exposure to antigen. Nat. Immunol. 2: 725-731. Annes, J. P., J. S. Munger, D. B. Rifkin. 2003. Making sense of latent TGFβ activation. J. Cell Sci. 116: 217-224. Trumpfheller, C., M. Caskey, G. Nchinda, M. P. Longhi, O. Mizenina, Y. Huang, S. J. Schlesinger, M. Colonna, R. M. Steinman. 2008. The microbial mimic polyIC induces durable and protective CD4+ T cell immunity together with a dendritic cell targeted vaccine. Proc. Natl. Acad. Sci. USA 105: 2574-2579. Bonifaz, L., D. Bonnyay, K. Mahnke, M. Rivera, M. C. Nussenzweig, R. M. Steinman. 2002. Efficient targeting of protein antigen to the dendritic cell receptor DEC-205 in the steady state leads to antigen presentation on major histocompatibility complex class I products and peripheral CD8+ T cell tolerance. J. Exp. Med. 196: 1627-1638. Iyoda, T., S. Shimoyama, K. Liu, Y. Omatsu, Y. Akiyama, Y. Maeda, K. Takahara, R. M. Steinman, K. Inaba. 2002. The CD8+ dendritic cell subset selectively endocytoses dying cells in culture and in vivo. J. Exp. Med. 195: 1289-1302. Liu, K., T. Iyoda, M. Saternus, K. Kimura, K. Inaba, R. M. Steinman. 2002. Immune tolerance after delivery of dying cells to dendritic cells in situ. J. Exp. Med. 196: 1091-1097. Wang, Z., A. T. Larregina, W. J. Shufesky, M. J. Perone, A. Montecalvo, A. F. Zahorchak, A. W. Thomson, A. E. Morelli. 2006. Use of the inhibitory effect of apoptotic cells on dendritic cells for graft survival via T-cell deletion and regulatory T cells. Am. J. Transplant. 6: 1297-1311. Huynh, M. L., V. A. Fadok, P. M. Henson. 2002. Phosphatidylserine-dependent ingestion of apoptotic cells promotes TGF- β1 secretion and the resolution of inflammation. J. Clin. Invest. 109: 41-50. Monteleone, G., F. Pallone, T. T. MacDonald. 2004. Smad7 in TGF-β-mediated negative regulation of gut inflammation. Trends Immunol. 25: 513-517. Barnard, J. A., G. J. Warwick, L. I. Gold. 1993. Localization of transforming growth factor β isoforms in the normal murine small intestine and colon. Gastroenterology 105: 67-73. Iwata, M., A. Hirakiyama, Y. Eshima, H. Kagechika, C. Kato, S. Y. Song. 2004. Retinoic acid imprints gut-homing specificity on T cells. Immunity 21: 527-538. Mora, J. R., M. Iwata, B. Eksteen, S. Y. Song, T. Junt, B. Senman, K. L. Otipoby, A. Yokota, H. Takeuchi, P. Ricciardi-Castagnoli, et al 2006. Generation of gut-homing IgA-secreting B cells by intestinal dendritic cells. Science 314: 1157-1160. Denning, T. L., Y. C. Wang, S. R. Patel, I. R. Williams, B. Pulendran. 2007. Lamina propria macrophages and dendritic cells differentially induce regulatory and interleukin 17-producing T cell responses. Nat. Immunol. 8: 1086-1094. Watanabe, N., Y. H. Wang, H. K. Lee, T. Ito, W. Cao, Y. J. Liu. 2005. Hassall’s corpuscles instruct dendritic cells to induce CD4+CD25+ regulatory T cells in human thymus. Nature 436: 1181-1185. Ochando, J. C., C. Homma, Y. Yang, A. Hidalgo, A. Garin, F. Tacke, V. Angeli, Y. Li, P. Boros, Y. Ding, et al 2006. Alloantigen-presenting plasmacytoid dendritic cells mediate tolerance to vascularized grafts. Nat. Immunol. 7: 652-662. Cozzo, C., J. Larkin, III, A. J. Caton. 2003. Cutting edge: self-peptides drive the peripheral expansion of CD4+CD25+ regulatory T cells. J. Immunol. 171: 5678-5682. Walker, L. S., A. Chodos, M. Eggena, H. Dooms, A. K. Abbas. 2003. Antigen-dependent proliferation of CD4+ CD25+ regulatory T cells in vivo. J. Exp. Med. 198: 249-258. Klein, L., K. Khazaie, H. von Boehmer. 2003. In vivo dynamics of antigen-specific regulatory T cells not predicted from behavior in vitro. Proc. Natl. Acad. Sci. USA 100: 8886-8891. Furtado, G. C., M. A. de Lafaille, N. Kutchukhidze, J. J. Lafaille. 2002. Interleukin 2 signaling is required for CD4+ regulatory T cell function. J. Exp. Med. 196: 851-857. Bayer, A. L., A. Yu, D. Adeegbe, T. R. Malek. 2005. Essential role for interleukin-2 for CD4+CD25+ T regulatory cell development during the neonatal period. J. Exp. Med. 201: 769-777. Malek, T., A. Yu, V. Vincek, P. Scibelli, L. Kong. 2002. CD4 regulatory T cells prevent lethal autoimmunity in IL-2Rβ-deficient mice: implications for the nonredundant function of IL-2. Immunity 17: 167-178. D'Cruz, L. M., L. Klein. 2005. Development and function of agonist-induced CD25+Foxp3+ regulatory T cells in the absence of interleukin 2 signaling. Nat. Immunol. 6: 1152-1159. Fontenot, J. D., J. P. Rasmussen, M. A. Gavin, A. Y. Rudensky. 2005. A function for interleukin 2 in Foxp3-expressing regulatory T cells. Nat. Immunol. 6: 1142-1151. Granucci, F., C. Vizzardelli, N. Pavelka, S. Feau, M. Persico, E. Virzi, M. Rescigno, G. Moro, P. Ricciardi-Castagnoli. 2001. 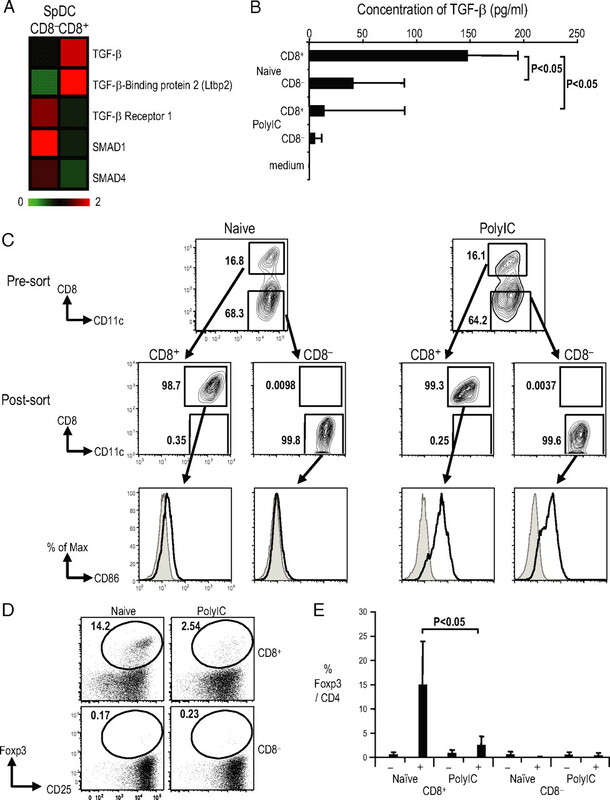 Inducible IL-2 production by dendritic cells revealed by global gene expression analysis. Nat. Immunol. 2: 882-888. Travis, M. A., B. Reizis, A. C. Melton, E. Masteller, Q. Tang, J. M. Proctor, Y. Wang, X. Bernstein, X. Huang, L. F. Reichardt, et al 2007. Loss of integrin αvβ8 on dendritic cells causes autoimmunity and colitis in mice. Nature 449: 361-365. Nakamura, K., A. Kitani, W. Strober. 2001. Cell contact-dependent immunosuppression by CD4+ CD25+ regulatory T cells is mediated by cell surface-bound transforming growth factor β. J. Exp. Med. 194: 629-644. Green, E. A., L. Gorelik, C. M. McGregor, E. H. Tran, R. A. Flavell. 2003. CD4+CD25+ T regulatory cells control anti-islet CD8+ T cells through TGF-β-TGF-β receptor interactions in type 1 diabetes. Proc. Natl. Acad. Sci. USA 100: 10878-10883. Li, M. O., Y. Y. Wan, R. A. Flavell. 2007. T cell-produced transforming growth factor-β1 controls T cell tolerance and regulates Th1- and Th17-cell differentiation. Immunity 26: 579-591. Huber, S., C. Schramm, H. A. Lehr, A. Mann, S. Schmitt, C. Becker, M. Protschka, P. R. Galle, M. F. Neurath, M. Blessing. 2004. Cutting edge: TGF-β signaling is required for the in vivo expansion and immunosuppressive capacity of regulatory CD4+CD25+ T cells. J. Immunol. 173: 6526-6531. Marie, J. C., J. J. Letterio, M. Gavin, A. Y. Rudensky. 2005. 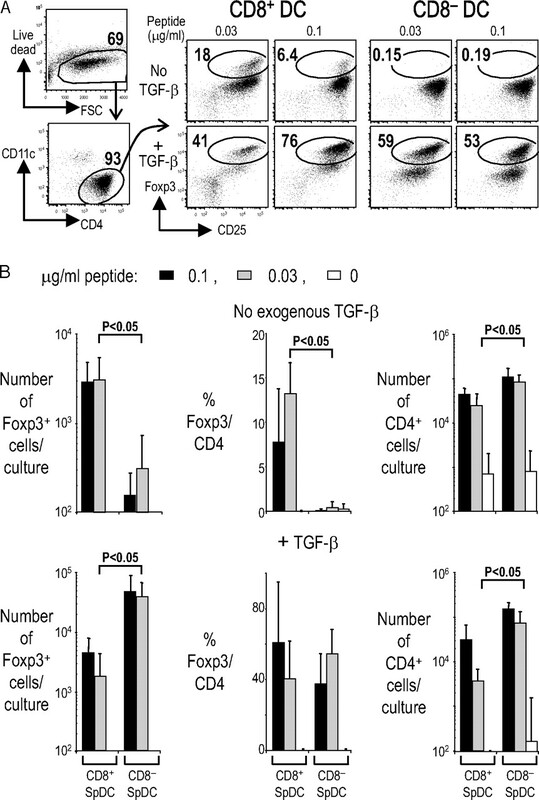 TGF-β1 maintains suppressor function and Foxp3 expression in CD4+CD25+ regulatory T cells. J. Exp. Med. 201: 1061-1067.